Since David Uosikkinen first began assembling a supergroup of local musicians three years ago to begin recording new versions of the city’s most classic rock and pop songs, he says, “I’ve had a lot of former Philly musicians living out of town tell me over the phone, ‘Sure, just send me your track, and I’ll lay my stuff down [over it].’ And I’ll say, ‘You know, that’s just not how we’re doing it.’” Uosikkinen, best known as the Hooters’ drummer before launching this new project, dubbed In the Pocket, isn’t being a luddite; to the contrary—in the late ‘90s, he was a key member of the team at MP3.com, helping to pioneer the digital music revolution. He’s just eager to capture the particular ephemeral magic that only comes from musicians bouncing sounds off each other face-to-face in real time. 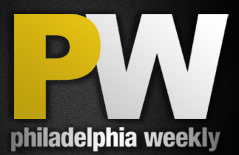 More than anything, the Philly music scene could use a little celebrating. And who better than the man behind one of Philly’s most beloved groups in history? Philadelphia’s music scene has accounted for some of the most influential and memorable moments in the entire popular music vernacular. Philly is where rock ‘n’ roll took its baby steps with American Bandstand in the 1950s, felt the smooth soul power of Gambale and Huff’s “The Sound of Philadelphia” in the 1970s, and rocked the MTV-soaked 1980s with The Hooters – just a smattering of Philly’s contributions to the national spotlight. Drummer David Uosikkinen of The Hooters has assembled some of that city’s best musicians for his “In the Pocket” project, a living, breathing celebration of Philly’s esteemed musical past. Rob Hyman of the Hooters has a lot of good things to say about his band mate in the Hooters — namely, the drummer David Uosikkinen. 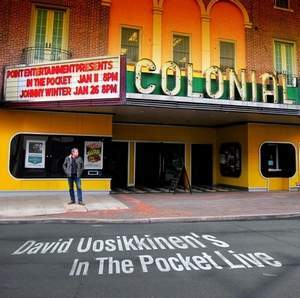 Fans of Philadelphia’s The Hooters take note, drummer David Uosikkinen and his band, In The Pocket are set to release their new CD, David Uosikkinen’s In The Pocket Live. Recorded at the Colonial Theatre just outside of Philly in January of 2013, Live features 11 live tracks and three bonus tracks. The ambitious and always musically tasty In The Pocket project, brings together all-star Philly musicians to cover classic Philadelphia tunes such as “Open My Eyes (The Nazz), “Change Reaction” (Robert Hazard), “Disco Inferno” (The Trammps) and “You Can’t Sit Down” (The Dovells). David Uosikkinen’s In The Pocket Live CD is available for purchase atsongsinthepocket.org now. 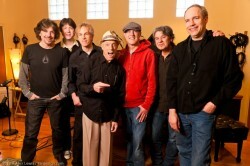 A portion of the proceeds benefit Philadelphia’s Settlement Music School. With six branches in PA and NJ, it is the largest community school of the arts in the United States serving 15,000 students each year regardless of age, race, or financial means. 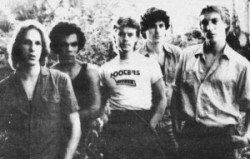 The band is marking the 33rd (and a third) anniversary of its first show in Levittown with a hometown gig in Philly. Drummer David Uosikkinen reflects on the eventful early days. |Publication: Kool Kovers: A musical blog project dedicated to showcasing excellent cover versions and lesser known original recordings of popular songs. 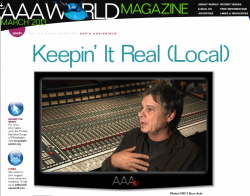 David Uosikkinen talks about the playing music festivals with The Who, Santana and The Clash! 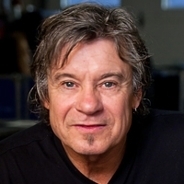 Hooters drummer David Uosikkinen is recovering from hip replacement surgery. Uosikkinen’s doing fine and will be back behind the skins in eight weeks or so. Need a Uosikkinen fix? 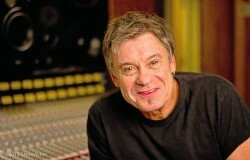 Check out his “In The Pocket” at songsinthepocket.org. 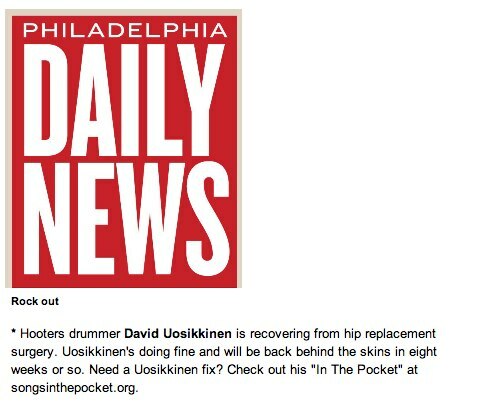 Drummer David Uosikkinen is no stranger to the Philly music scene. As a founding member of “The Hooters,” Uosikkinen has enjoyed a storied career and played at some of rock’s legendary concerts, including “Live Aid” (1985), “Amnesty International” at Giants Stadium (1986) and “The Berlin Wall” (1990).